Wow. Can we just take a moment to marvel at the fact that Tiny Epic Quest is the fifth entry in this series of small-yet-usually-pretty-good games? From warring kingdoms to defending kingdoms, from outer space to the Wild West. All in a little more than three years. Scott Almes is nothing if not prolific. Anyway, this is probably the best the Tiny Epic series has ever been. Though that might be because it’s just so dang photogenic. If we’ve learned any one thing about Scott Almes and Gamelyn Games’ Tiny Epic series now that we’ve reached the fourth entry — the previous ones being Kingdoms, Defenders, and Galaxies — it’s that they’ve got a lot of heart. Maybe even more heart than bite, sometimes, maybe. It isn’t that they aren’t tiny, because sure, on a particular scale they’re downright microscopic. And it isn’t that they aren’t epic; when a word has lost all meaning, there’s no reason to keep championing it. Rather, it’s that they live up to their pitch. They’re portable, functional, and for being so compact and workmanlike they’re also decently good times when you don’t have a whole evening to burn. The problem with that theory is that Tiny Epic Western is actually the sort of game I might play as a non-filler. The audacity of the Tiny Epic series has never been more pronounced. First they were proclaiming a kingdom both tiny and epic, then a battle. Now it’s the whole damn galaxy. Plural galaxies, even. Then again, the upside is that Tiny Epic Galaxies is the best thing we’ve seen yet from Gamelyn Games, so maybe we’ll give those oxymorons a pass this once. This once. “Tiny” and “Epic” very rarely go together — usually only during my annual checkup. 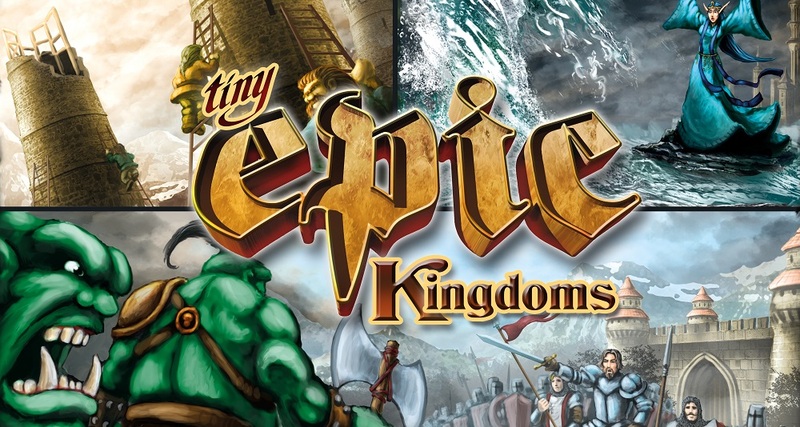 However, Gamelyn Games has been carving out a niche for themselves with the diminutive and monumental, and their previous game, Tiny Epic Kingdoms, was a pleasant little experience perfectly suited for casual fare between the main courses of a game night. Its spiritual sequel, either a solo or cooperative game this time, is better suited for a lonely night on the tundra. If you’ve brought a match, at least you’ll have a way to keep warm. If there are two things everybody fantasizes about, it’s the exploration of virgin lands and captaining an airship as it unloads its cannons at another airship. I’d also settle for captaining the Starship Enterprise. Fantasy Frontier makes both dreams a reality (provided you count a board game as a legitimate version of reality, that is), and that’s still only half the story. One of the things I love most about Kickstarter is that it helps bring weird little games like Dungeon Heroes into the world. Why call it “weird” and “little,” you ask? Well, the second adjective is easier: it is rather little, which is a point in its favor considering how crowded my shelves are these days. 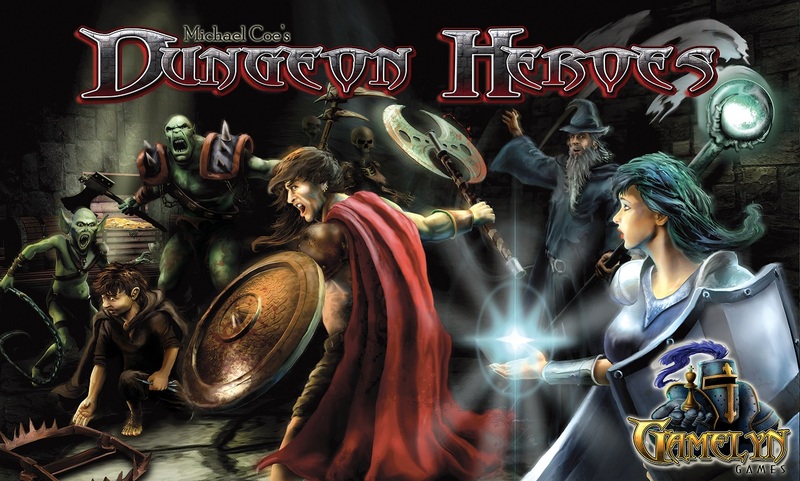 As for the other, its Kickstarter pitch described it as a “lunch break dungeon crawl,” which seemingly not only misses the epic-length point of dungeon crawls, but takes a detour through an entirely different town than the one the point is living in. Weirder yet, it’s so asymmetrical that the dungeon master is playing a totally different game than the one the adventurer is playing. But does it work? Let’s take a look!